Port St George, real estate in the Bahamas. 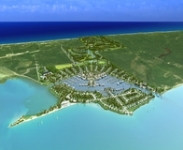 Port St George, to be constructed in the northern part of Long Island, will be The Bahamas' first eco-engineered luxury destination and is designed to provide the ultimate in tropical island living. Occupying less than one percent of Long Island, a naturally beautiful island in the southern Bahamas, this 882-acre residential resort will provide a luxury oasis from which to explore the wonders of nature that surround it. The exciting mix of five-star hotel, 640 berth marina, 18-hole golf course, tennis, baseball, athletics, cricket and football facilities at Port St George will be complimented by a beach club, a yacht club, a culinary institute, retail, commercial and open-air market premises. 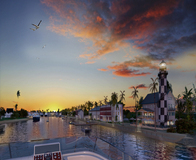 The amenities of Port St George will surround a variety of homes ranging from waterfront condominiums and townhouses, through marina penthouses to golf course mansions. All of this real estate will be delivered to the highest standards of sustainability that can be achieved, with future proofing built in to ensure your home at Port St George represents a sound investment. 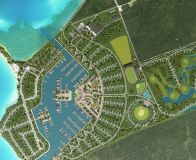 With the necessary permits for the development already granted by the Government of The Bahamas, Port St George has now appointed the Manhattan based StarPort Resorts (www.starportresorts.com) to deliver and market the development.